The call set into motion a dispatch to various employees throughout the airport, including a janitorial services crew that found Hobbes near the children’s play area at Airside C and rushed it back to the Airport Operations Center. Then AOC Manager Tony D’Aiuto had an idea. Why not take the tiger on a tour while he awaits his owner’s return? D’Auito, with the help of TPA police, airlines, operations staff, the USO and others all over the airport campus, photographed Hobbes on his great adventures: outside by the air traffic control tower, buying gelato, working out at the employee gym, playing Jenga in the USO, hanging out with the firefighters, napping in a hammock by the Marriott pool, riding a luggage cart. 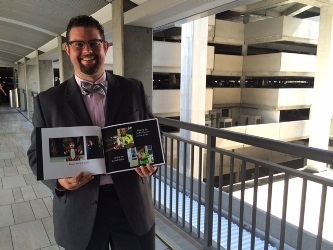 D’Aiuto had a coupon code to make a hardbound photo book at Walgreens, so he made a storyline to go with the photos, printed the book and left it in Lost and Found for the family to pick up along with Hobbes when they returned to Tampa International Airport on a late-night flight on June 11. Meanwhile in Texas, Owen’s mother, Amanda Lake, was constantly reassuring her son that Hobbes was in good hands. 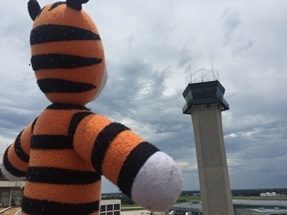 While she learned within an hour of landing in Houston that TPA had found the handmade tiger and told Owen that Hobbes was on an “adventure” while they were vacationing, she had no idea what was going on at TPA. She just hoped they were keeping him safe. The family returned to the airport, got their luggage and car and went straight to the AOC lobby to get Hobbes. There, AOC Manager James Parker presented Owen with Hobbes and the photo book detailing all of the tiger’s hijinks at the airport. His mother cried when Parker showed Owen the book.